Benchmark International are proud to announce that we have been nominated for an award at Insider’s prestigious Dealmakers award ceremony which will take place on 24 October 2013 at Manchester Central. Market factors inevitably play the most significant role in successful deal completions. Industry conditions, the state of local and global economies and country specific governmental legislative environments will largely effect demand and realized value upon any company sale. 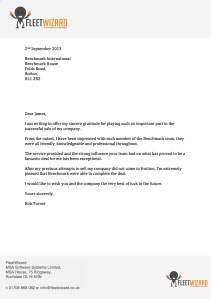 Today we received a very nice letter from Bob Turner of Fleet Wizard (formerly trading as Fleet Auto-Mates) thanking Benchmark International for the role we played in the sale of his company. Based in Greater Manchester, Bob Turner sold the Company, MSA Software Systems to the Cheshire-based IT services company in March 2013. As we have mentioned previously, a lack of spending within the Private Equity industry is creating significant pressure to invest. This is good news for business owners looking to exit their company as the huge sums of money available means that Private Equity firms chasing well performing businesses.